Hillary gave a rare press conference. It was terrible. 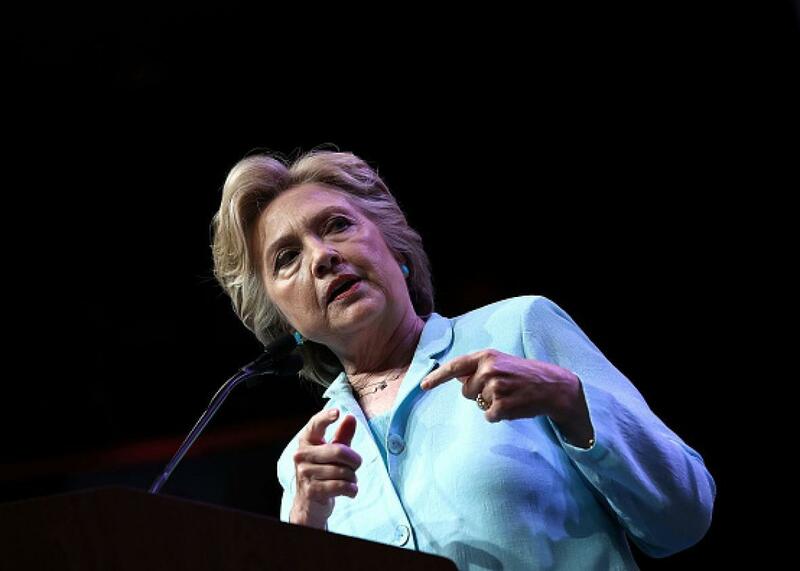 Hillary Clinton addresses the National Association of Black Journalists and the National Association of Hispanic Journalists August 5, 2016 in Washington, DC. In Friday’s press questioning, the trouble began when she was asked her first question about her private email server and recent statements about that server which independent fact checkers have labeled as categorically untrue. Clinton’s responses here—and her previous responses to questions about the truthfulness of past statements—are so overly legalistic and convoluted that they are difficult to even explain. But here’s a shot. This is the claim that fact checkers have destroyed. Clinton’s defenders might claim that she was talking about two separate things in two separate clauses in this sentence: That Comey said her answers to the FBI were truthful and separately that her answers to the FBI were consistent with her public statements. This would have made the statement incredibly misleading, though, given that she was asked directly about what Comey’s views. Also making that answer seem disingenuous at best, and a lie at worst, is that she repeated a similar version of it in an interview earlier this week, telling a local CBS affiliate: “It was all personal stuff [that was deleted on the email server], and we’ve said that consistently. And as the FBI said, everything that I’ve said publicly has been consistent and truthful with what I’ve told them.” It’s really hard to argue that this is two separate points, with the “and as the FBI said” part referring to the earlier point, but I guess a really eager Clinton apologist could make that claim. Are you mischaracterizing Director Comey’s testimony and is this not undercutting your efforts to rebuild trust with the American people? I was pointing out in both of those instances, that director Comey had said that my answers in my FBI interview were truthful. That’s really the bottom line here and I have said during the interview and other occasions over the past months, that what I told the FBI, which he said was truthful, is consistent with what I have said publicly. So I may have short circuited and for that, I, you know, will try to clarify because I think, you know, Chris Wallace and I were probably talking past each other because of course, he could only talk to what I had told the FBI and I appreciated that. Yikes. Anyways, what she said here is not only difficult to parse, it also is misleading at best and false at worst. As described, in those interviews she seemed to be directly offering that Comey had put her in the clear in regards to her public statements, not her answers to the FBI. Here’s what—here are the facts behind that as well. You know that I preside—I sent over 30,000 e-mails to the State Department that were work-related e-mails. Director Comey said that only three out of 30,000 had anything resembling classified markers. What does that mean? Well, usually, if any of you have ever served in the government, a classified document has a big heading on the top. Which, makes very clear what the classification is. And in questioning, director Comey made the point that the three e-mails out of the 30,000 did not have the appropriate markings. And it was therefore reasonable to conclude that anyone, including myself, would have not suspected that they were classified. Comey did tell Congress that it was possible that Clinton was not “technically sophisticated” enough to recognize the classified markings on the emails in question, but government officials should pay attention to such markings. When asked why her polling numbers on trustworthiness were so low, Clinton also blamed conservative critics. “It doesn’t make me feel good when people say those things, and I recognize that I have work to do,” she said. She then cited her high approval ratings as Senator in New York and Secretary of State, and claimed that the numbers only came down whenever she was running for high office. “Maybe, just maybe, when I’m actually running for a job, there is a real benefit to those on the other side in trying to stir up as much concern as possible,” she said. Ultimately, that she didn’t even try to come up with a single anecdote from 50 years of friendship to act as a representative example of a meaningful conversation with a black friend—if not the most meaningful conversation—is almost as much of an indictment of Clinton’s forthrightness with the press and public as her email answers.